'Spirit of Victory' was successfully completed in July. Tracey Curtis-Taylor flew into the American Airpower Museum at historic Republic Airport, New York on July 9 in her Boeing Stearman to a fantastic reception from the aviation community and well-wishers. Several other Stearman aircraft were there to meet her on the tarmac, and she was piped in by the local school band St Johns High School Bagpipers, in bright yellow and black kilts. At the reception, Tracey was thrilled to meet members of the 'Ninety Nines', the international organisation of women pilots which was established in 1929 by Amelia Earhart and see the exhibition dedicated to the Women's Airforce Service Pilots (WASP) of WW2. 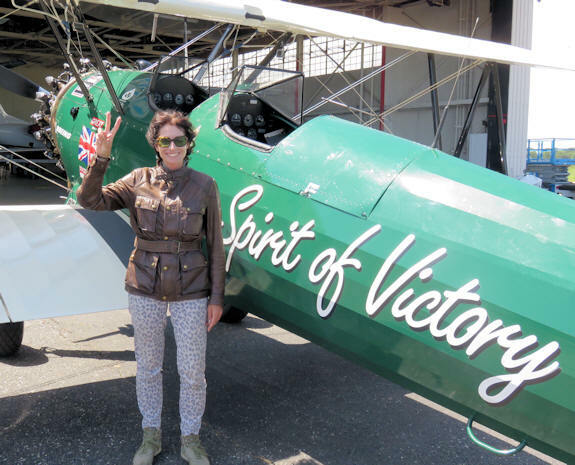 Tracey left Los Angeles on June 22 and flew the 3,000mile route across America to New York in 13 legs over two and a half weeks with various stops en route for filming and sight-seeing. There were many highlights including a visit to the Boeing Apache helicopter production plant in Phoenix, a poignant return to Winslow where she crashed last year; two glorious days of nostalgia visiting the old Boeing factory in Wichita where Tracey's Stearman was built in 1942; and seeing old friends at Galesburg Municipal Airport, home of the Stearman National Fly-in, where Tracey was guest speaker last year. The finale flight was up the Hudson River past the Statue of Liberty and the Manhattan skyline in a golden sunset. 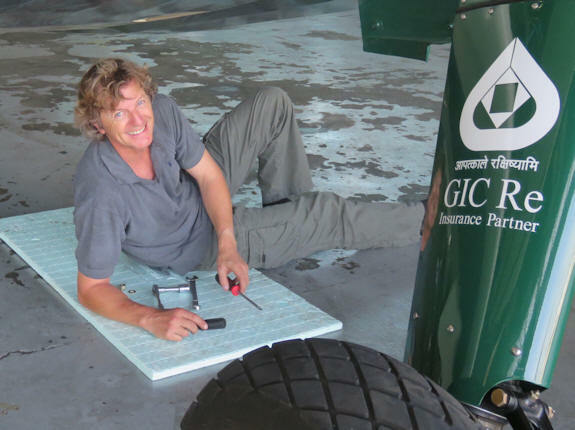 A fitting end to the global expeditions which have taken Tracey and her Boeing Stearman across five continents. Here is a quote from the President of Boeing International recognising their achievements (and here are some images of a magical flight around St Louis with Boeing President and CEO, Dennis Muilenburg. 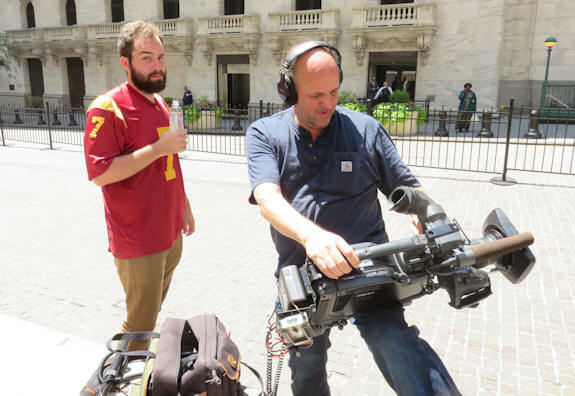 Max Sherman and cameraman, Simon Fanthorpe, pictured below. The Boeing Company, Dr Randy Sherman and everybody at Santa Monica Airport, the incomparable Clay Lacy and helicopter ace, Steve Stafford; the Commemorative Airforce at Falcon Field, Phoenix; Dwayne Clements and Stearman Field,Wichita; the Kansas Aviation Museum and Spirit Aerosystems, also based in Wichita; Creve Coeur Airport in St Louis, Philip Wolford and his team at Jet Air, Galesburg Airport, Kevin Daniels in Santa Fe and Kenny Roller in Cleveland, and the delightful and dedicated team at the American Airpower Museum at Republic Airport. The Spirit of Victory has now been shipped over the Atlantic and will be back in the UK during the autumn. The final compilation and editing of the documentary film about all of Tracey's expeditions over the last five years is underway and will be completed for release in 2018. 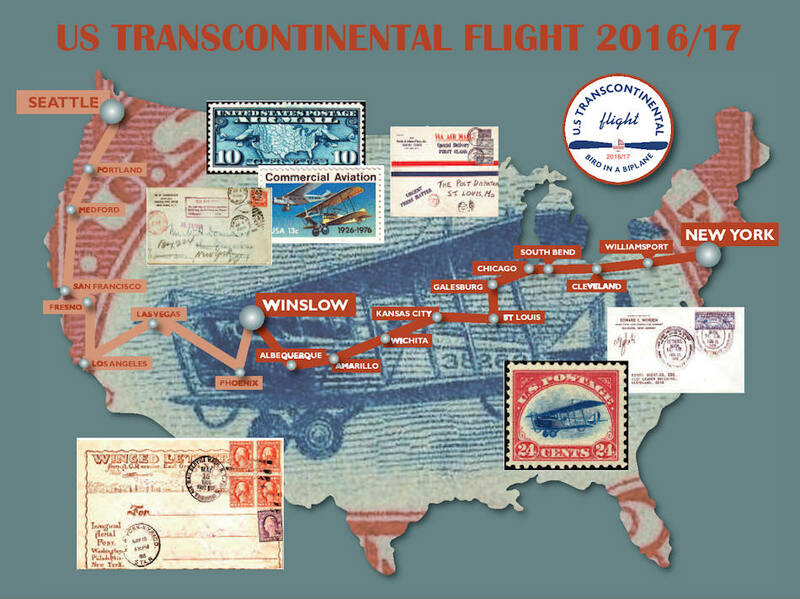 Click here to go to photo galleries for 2016 and 2017 US Transatlantic flights. To contact Tracey please click here.